Files Compare is a visual tool for files and directories comparison. 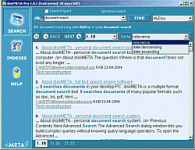 It helps you to compare and merge different versions of the same textual file. A color-coded side-by-side comparison makes it easy to understand differences between two files at a glance, powerful editing engine helps you to merge found changes and edit text directly. Files Compare has a number of simple and convenient features that many users have been expecting for a long time from a comparison program. 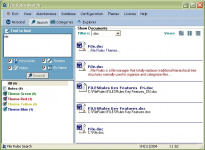 The main features of Files Compare Tool are: - Displaying files side-by-side; - Colored differences sections to simplify analyzing; - Move changes between files with single mouse click or keystroke; - Easy navigation through the differences; - Ability to edit files directly in comparison window; - Allowing to ignore blanks, case and whitespace; - Regular expressions support; - Customizable fonts and colors; - Adjustable pane splitter and synchronized scrolling; - Editor with undo/redo, search and bookmarks; - Include/exclude files and directories filters; - Copying and deleting files directly; - Drag and drop support for dropping one or two files or directories for comparison; - Macros on VBScript and JScript; - Export comparison results to HTML; - Differences panel and more.